Downriggers are a valuable piece of equipment for use in both inshore and offshore fishing. Here we will work with offshore use only. Downriggers are used for trolling at a prescribed depth just like you troll baits along the surface. Offshore water are made up of many layers of different temperature water. These are called thermoclines. 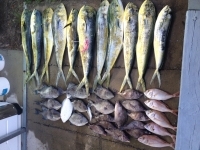 Offshore game fish will hold in the thermocline that they like best. Maybe the water at the surface is a little too warm for them and the water at the bottom is a little to cold. So your trolling along and see all these fish at the 45 foot mark on your colorscope and you see a wavy line just above them at say the 40 foot mark. ( Your colorscope needs to be adjusted just right to be able to see thermoclines ) So what we want to do is put the bait right at the 45 foot mark hoping to catch Mr. Gamefish. This is what the Downrigger is for. So lets set up and use a set of downriggers. Downriggers come in many different shapes and sizes. For offshore use I recommend that you buy a manual one the first time. Look for one that has a long boom on it and make sure that you buy the swivel plate that goes with it. The swivel plate will allow you to turn the downriggers in what ever direction you wish. This is a nice feature so that you can turn them in when pulling up to the dock and turn them out when in use. I recommend Cannon or Penn Outriggers. They are both easy to use and durable enough to standup to offshore use. Now we have to rig them on our boat. Pick a location as far back and outboard as possible. This is so that we can use them without tangling them up in anything else. Ok, So we have them mounted, what's next? There are two more pieces to the puzzle that we need. The downrigger ball and the release clip. 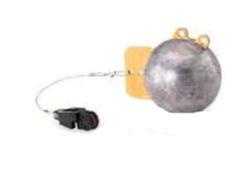 The downrigger ball is a heavy metal ball with a couple of attachment points on it. I like the balls that have fins built into them. The fin makes the ball track straighter. The release clip is a pressure clip that is squeezed onto the line from the pole. I take the line and pull a piece about 4 inches long and turn it to form a loop. Then twist the loop 2 or 3 times and put the end of the twisted loop in the jaws of the pressure clip and set the clip. There is a set screw on most of the clips that you can use to adjust the pressure on the line. More pressure makes it harder to pull out. It is something you will have to play with a few times to get it set so that is does not come out every time you sent it down but comes lose easily when a fish strikes. So now we have our downrigger mounted and it has wire already on it, we have a ball and release clip. It's time to go fishing. Boom " GOT' EM ON" OK, we have hooked one. Grab the pole and fight the fish but you have to pull the downrigger up before he gets close to the boat.. If you do not pull the downrigger when you get the fish close ,he will wrap himself around the wire and cut the line so the downrigger must come up.